A Drive up the Rupert Craig Highway carries you past the villages of Plaisance and Sparendaam on the East Coast of Demerara. My dad had once pointed out that what most people referred to as the “Catholic Church in Plaisance” was actually situated in Sparendaam (this would be the Church of St John the Baptist), and I couldn’t help but notice that the Saint Paul’s Anglican Church at Plaisance is also in Sparendaam. As with most of the place names in Guyana, they reflect our past colonisations and our change from Colonial rule to Independence, the name Plaisance is of French origin, and Sparendaam comes from the Dutch. Our last colonial masters were the British, when our country was known as British Guiana, and the two main streets running the length of Plaisance were (and to some extent still are) Queen Victoria Road and Prince William Drive. During the “Burnham years”, one of the changes (some might call it an attempt to eradicate our history) was to rename streets that held “colonial names” to names that were more meaningful to a country emerging from colonial rule and striving for successful Independence. In Georgetown one of the more notable changes was the renaming of Murray Street to Quamina Street. John Murray was the Lieutenant Governor of Demerara from 1813 to 1824, Quamina was a slave involved in one of the largest slave revolts in Demerara during that time (in 1823 actually). In Plaisance, Queen Victoria Road was renamed to Ben Profitt Drive, and Prince William Street was renamed to Andries Noble Avenue. Ben Profitt was a notable village chairman of Plaisance, and Andries Noble is touted to be one of the best midwives of Guyana, there’s probably very few people over the age of 35 from Plaisance and Sparendaam whom she didn’t help bring into this world. Although the name changes were made more than a couple of decades ago, the streets are still referred to by many using the original names, although most people who have grown up in the villages know them by both names, So St Paul’s Anglican Church is sometimes referred to as being on Queen Victoria Road, and sometimes on Ben Profitt Drive, likewise it is also sometimes referred to as being in Sparendaam, as well as being in Plaisance.. 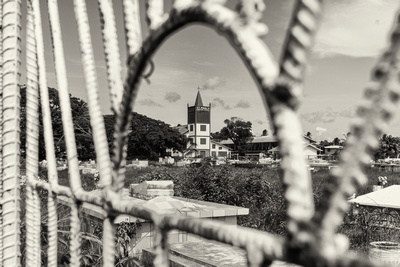 I started this blog post just wanting to say something about St Paul’s Anglican Church other than “Here is a photo of the church with it’s cemetery as seen through a gate in its fence”, one thing led to another and now the post is almost 500 words long. Click on the image to see it better in the Gallery, along with other images from this year’s Deck Project.